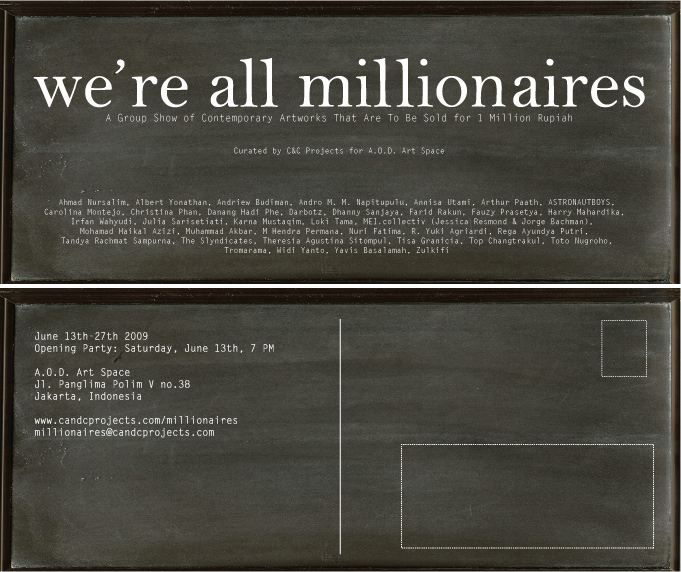 "We’re All Millionaires" is a group show of contemporary artworks that are to be sold for 1 Million Rupiah. The exhibition concept aims to poke fun at the cultural misconceptions of the term “millionaire”, and address the oddities of art economics and ownership status. This will be the first collaboration between C&C Projects and A.O.D. The goal of "We’re All Millionaires" is to find and present artists who are pushing new ideas and new ways of seeing. C&C+A.O.D. is dedicated to providing these artists and their audience with an alternative to the high-end gallery system. Association of Division (A.O.D) is the creative studio responsible for fashion misfits Notorious Fam, Bizarre, and Proud Parents. The A.O.D. space opens as a temporary store 4 times a year to showcase each new season. Chris Kerrigan and Cynthia Wirjono are the husband and wife team behind C+C Projects. Together they collaborate on various projects including curating exhibitions, clothing and furniture design, photography, and styling.